First of all, it can be exhausting…and when you have to put more effort in than you get back in enjoyment, it’s just not worth it. Second, it can be tricky to keep traditions when time, circumstances and the people in your life change. Third (and I think this is the best argument against family traditions), sometimes no one knows why a given family tradition exists, what purpose it serves, or who actually enjoys it. If that’s the case, I say ditch it. Family traditions are actually very important. Change them a little, add new ones, do what works for you–as long as you keep some traditions. 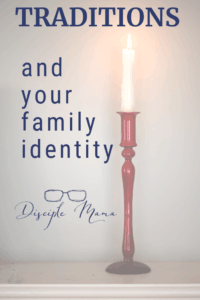 Before you read further, I want to let you know that this post is actually Part 3 of my series on Building Family Identity. 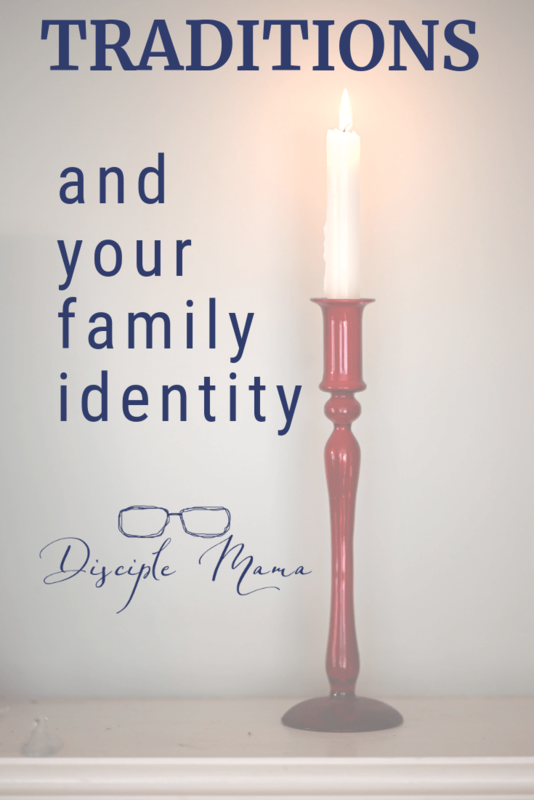 Feel free to start here, but you might like to begin by reading Part 1: Building Family Identity, and Part 2: Core Values. The last post in the series, Part 4: Family Stories, will be published next week. As Christians, we know quite a bit about traditions. A lot of the things we do in church and even at home are based more on tradition than on biblical directives. That doesn’t mean they’re bad, but it goes to show how powerful customs can be. Do you pray before you eat? That’s a tradition. I think it’s a great thing to do, but still: it’s a custom. A very powerful custom. give us a way to pass on our values to our children. People tend to remember traditions more than most other things about their childhoods. Why? Probably because they were repeated regularly and had special meaning or significance! Since traditions are memorable by their very nature, it makes sense to tie them to the things that matter most to us: our families, religious days & events, and, of course, our family core values. One caution, though: It’s easy for children (and adults, honestly) to conflate traditions with mandates. I think it’s important to be careful to explain the difference to our kids. Is it sinful to eat food you haven’t prayed over? You probably don’t think so, but your child may not understand that. 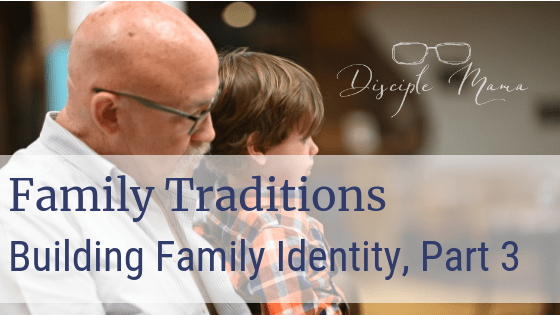 This month we’re diving in to building family identity in Christ, so I’ve identified 4 basic actions you can take to make your family traditions do just that. Evaluate existing traditions to determine whether they harmonize with your core values. Shift or modify traditions to support your family core values. Implement new traditions that help your family celebrate your core values. How do you build a family tradition? 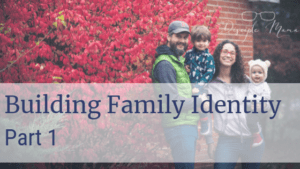 As you think about building your family identity, you may decide that it would be fun to start some new traditions to support your core values. It’s a great way to make positive emotional connections between members of your family and helps attach your core values to memories that will last forever. Please don’t think that you need to have some sort of elaborate tradition for everything on your core values list. Just think about what makes sense for your family! You may not want to add any new traditions at all, or you may want to add something small and simple. If it feels forced or like too much work, don’t do it. 1. Take an existing tradition and change it. This is arguably the more difficult of the two options, actually. It will depend on how deeply entrenched your family is and how drastic the changes are. To change an existing tradition, I’d recommend baby steps, so that it stays recognizable to everyone who loves it. Traditions change naturally and organically all the time, simply because the people who carry them out change over time. Also, times, methods, and equipment change. If it makes sense to change your traditions to support your family’s core values, don’t be afraid to do it. But, if there’s no need, don’t mess with something that’s working for you. This one is pretty simple. Just start the tradition and then do it again when the next appropriate occasion rolls around! Well, I guess there’s a little bit more to it than that, but in my experience if you decide what you want to do, talk it over with your family (and whoever else may be involved), and do it! If it’s a total failure the first time around you can always rethink it and try again next time. But, if it’s pleasant, meaningful, and doesn’t require a huge time commitment (or perfect weather conditions, etc.) you should have success. People start new traditions all the time, and it’s often by accident. For example, my husband and I had waffles for breakfast before church one Sabbath morning. They were good. So, we had them again the next Sabbath. And again, and again, until we began calling them Sabbath waffles. (Why are all of my traditions food-related?!) We’ve actually modified the tradition a little, and we’ve been having Sabbath pancakes for the past couple of years due to our son’s sensitivity to eggs. But, he seems to have outgrown the issue, and last Sabbath? Waffles. We want our kids to “Call the Sabbath a delight.” Waffles are delicious and help make Sabbath morning something to look forward to. Sabbath morning is crazy for us. My husband is a pastor, so he often leaves quite early on Sabbath morning, and after breakfast my time is spent trying to get myself and the boys ready and out the door on time. Making Sabbath waffles a priority gives us at least a few minutes to sit at the table together as a family to begin Sabbath morning. The waffle recipe we use is one of my husband’s family recipes, and it helps connect him and our children to the family cooking heritage. Also, there are some weeks we just don’t have Sabbath waffles. Maybe we’re sick, or we just don’t have time, or maybe we forgot to buy eggs. It’s rare, but it’s not the end of the world. You don’t need to be a slave to your family traditions. It’s not the tradition that’s really important, it’s the principle behind the tradition. If you keep the Sabbath, selecting some intentional traditions for your family can help connect you and your kids to the deeper meaning of Sabbath rest, and help them view it as a day to look forward to spending with God and with family and friends. In our home, we don’t make a HUGE deal of birthdays, but we do try to make it a special day and we try to include close family and friends in our celebrations. 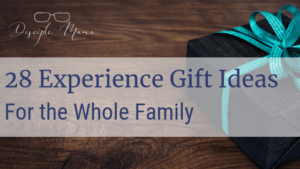 What I’m sharing here is not even close to an exhaustive list of ideas for family birthday traditions, but it will give you a jumping off point for choosing special ways to celebrate a new year of life for one of God’s special children! Birthday guy/girl’s choice! Allow each family member to choose a special family meal for their birthday. Go to a favorite restaurant. I know a family who visits the same restaurant together for every family birthday. If you can all agree on a favorite place, this would be a fun one! Have a special birthday dessert. My husband (and the rest of his family) always asks for yellow cake with chocolate frosting for his birthday. We let our sons choose what sort of cake or cupcakes (or other dessert) they’d like to have for themselves. It’s a special day, make it a special treat! Wake ups- Find a special way to wake up the birthday person! Sneak in and sing instead of having them wake up to the alarm. Note: If your person is a grumpy waker, maybe you should skip this one…or you can just sneak in and leave some fun balloons or something that they’ll see when they wake up on their own! Affirmations- Go around the room and have everyone say something that they love and appreciate about the birthday person (this works well at meal time). This will give you a chance to recognize their God-given gifts and talents, and reinforce positive character traits. Go deep with this one, don’t waste the opportunity on superficial compliments. For Thanksgiving, I’m not even going to bother with listing food traditions, because everyone has their own, and I don’t think you need my help with that! One thing I WILL say, though, is that Thanksgiving food traditions can be tough on people when someone has developed an allergy or adopted a new diet for other health reasons. It’s not always easy to accommodate special diets, especially where traditional family recipes are concerned, but speaking as someone that spent the last holiday season on a brand new dairy/egg/soy/grain/gluten/grape/strawberry/bean-free diet, I guarantee that if you make an effort to feed someone with food restrictions (even if it’s only one dish), they will appreciate it! Practice gratitude– Go around the table and tell each other what you’re thankful for. Focus on what God has done in your life in the past year. Get outside– Even if it’s cold where you are, try to get out for a walk (or maybe a game of touch football). It’s great to spend time together enjoying nature, and it won’t hurt to move around a bit after that delicious meal. Prep/Cleanup together– When I was a kid, we’d have a huge Thanksgiving meal at my grandparents house. My mom and my aunts, with my Grammy in charge, would prepare the meal, and my dad and my uncles would wash the dishes and clean up the kitchen afterward. I have great memories of everyone chatting and joking together as they dove in to the huge job of making and clearing dinner for all of us, and it helped teach me that many hands make light work! Practice hospitality– Invite someone that can’t be with his/her family for the holiday. Open your home to students or young professionals that don’t have enough time off or can’t afford to go home for Thanksgiving. Take Thanksgiving to the community– Take your family and help host a Thanksgiving meal at a shelter or a nursing home. Okay, I left out food for Thanksgiving, and I’m not going to say much about meals for Christmas, either. I’ll mention gifts a little bit, but the focus here is on family togetherness and Christian values. Go caroling for a cause– Check with your local hospital to see if they have special caroling dates and times set aside (these may not be on Christmas day), or if they are open to you coming in and caroling. Or, choose a charitable cause and go around to local businesses and homes and ask for donations! Note: if you ask for donations, be sure to work with the charity so you can assure donors that the money will be going where you claim! Get to know the neighbors– bake treats for the neighbors and deliver them in person. Or, visit the local police and fire stations with treats and sincere thanks for their work! Read the story of the Nativity– Matthew 1:18-2:12 includes more detail, and Luke 2:1-20 is a bit more concise. Go out and look at Christmas lights– I know a family who got in their Christmas jammies, loaded up the car with hot chocolate and special snacks, and drove around on Christmas Eve, looking at Christmas lights and just enjoying time together. Write a letter– Many children write letters to Santa on Christmas Eve, but perhaps this tradition can be shifted to writing a letter to Jesus; not to give Him a list of what gifts we’d like, but to reflect on the past year and pour out our hearts to Him on paper. I think it would be nice to have a quiet time set aside for each person to do this. You could decide whether to come together and share the letters, or to simply end the time with a family prayer. I haven’t heard of anyone with this tradition, but it popped into my head a few months ago, and I’ve been thinking about doing it as our kids get older. Play games– In my family, after we open gifts, we play games together. Everyone gets a turn to choose (and then we start the rotation over again). If you’ve spent much time on my blog, you know that even small children can have fun playing table games, and it’s great family bonding time! Use your new gifts together– Often, gifts are opened in the course of just a few minutes and the rest of the day is spent with everyone examining or playing with their new stuff. But, if you give experience gifts or select high quality toy gifts that everyone can use together, you can spend some fantastic quality time sharing your gifts and having fun together. Visit shut-ins– Find out if there are neighbors or church members that don’t get out of their houses, and may not have company on Christmas, and visit them. Bring a small treat, and spend time talking and listening. Offer to pray with and for them before you leave. Resurrection eggs– Grab yourself a set of Resurrection Eggs (or, even better, DIY a set!) Use the little objects inside as visual aids to tell the Easter story to your kids. Make empty tomb rolls– Have you heard of empty tomb rolls? They’re a delicious treat that you can make (easily) as a family while illustrating the wonderful surprise of the empty tomb on Easter morning! We made ours with pre-made crescent roll dough and vegan marshmallows using this recipe from Oh, Sweet Basil! Want more information? Check out this post for these and more ways to have a Christ-centered Easter! When we think of family traditions, we almost always think of birthdays and holidays, but some traditions aren’t necessarily tied to dates. If you follow me on Instagram, you probably know that we have muffins most Wednesday mornings. I make them while my son and husband are at our church’s early morning prayer meeting. This is another example of an accidental tradition. One day, I surprised them with muffins when they got home, and since then, muffin Wednesdays are a thing. It’s easy, but still special, and we always have a nice time together eating our muffins and listening to my 3 year old’s report on how prayer meeting went that day. Fruit picking– if you live in an area with any u-pick fruit, this is an activity that is so much fun for the whole family, and it helps kids make the connection between the food they eat and the farms it comes from! Family photos– take a cute picture of your family whenever you go somewhere new or do something fun. It doesn’t have to be perfect or serious. Just document the fun and make some memories. Parent/child outings– When I was a little girl, one Sunday per month was date day. One month, my mom would take me out, and the next my dad would. The other parent took my sister out for a special outing. We got one on one time with our parents (which is rare in most families), and it was special because they’d plan something simple, but really tailored to our individual tastes. This is trickier if you have more children than parents, so you may need to enlist a close friend, family member, or find a babysitter to help you rotate through all of your children. What family traditions do you keep? 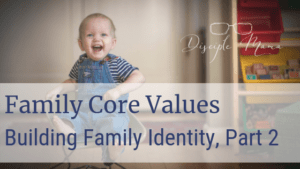 Are you intentional about supporting your core values with the traditions your family has in place? I’d love to hear from you in the comments below! Great post – love your ideas, I will certainly be borrowing a few of your ideas. The two boys and I have a “boys film night” every time a new Star Wars / Mission Impossible / Star Trek type movie comes out. Wow, those are some really fun traditions, Bob! I love the memories of the little (and big) traditions from my childhood, and I want to pass those on to my kids, with purpose and intentionality. Thanks for visiting my blog again today! I love traditions, too 🙂 They’re a great way of spending time with family and friends. That’s a great point. I’d say that 90% of what’s important in church and Christianity is built on tradition. Oh yes, Edna, food traditions are some of my favorites! I will say, though, that it was a big struggle for me over the past year when I was on a limited diet due to my son’s food sensitivities. It’s almost like a lot of the enjoyment of special events is tied to food, and it’s tough to not have pie on Thanksgiving, or hot cocoa at Christmastime. I really had time to think about how important it is to make sure my family has non-food traditions for these special times, too, because you never know when health issues will arise and certain foods will be off-limits. I don’t want all of the holiday traditions to disappear if we have to give up a certain food group! Thanks for your comment and for visiting my blog again! I see, yeah, there are so many people who struggle with food sensitivities these days. Wonderful article! This has me thinking about the wonderful family traditions I have had in the past and how my husband and I need to create some new ones for us. Thank you for sharing! Hi Michelle, I am so glad you enjoyed this article! I hope it’s helpful to you and your husband as you intentionally form new traditions and shape precious memories for your family. Please come back and visit the blog again soon! These are great ideas for traditions within the family. You’re very intentional about your parenting – I’m sure I’ve praised you for that before in a comment – and intentionality is very important, given the responsibility we have as parents. We enjoyed these types of traditions greatly with our children as they were growing up. Now, on the other end of raising a family, it’s interesting to see what traditions our children keep as they marry and establish their own families, and what traditions get pitched, because they don’t blend with the traditions their spouses brought to the marriage. It varies with each child, because all are unique and all marry entirely unique people. Traditions aren’t traditions for their own sakes, but because they build the harmony and identity of the family. Some will go forward to the next generation, and some will not. Enjoy those traditions with your children for the joy they bring to all of you and the unique family bonds you form. We do try to be intentional with our parenting, and any success we have is credited to the work of the Holy Spirit on our hearts (and the hearts of our kids). 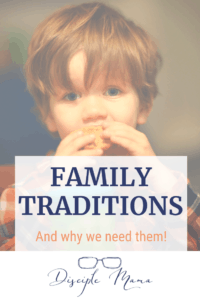 Melinda, you’re exactly right about traditions not being traditions for their own sakes, but a lot of times we don’t take the time to think about the reasons behind them, or to explain those reasons to our kids! A marriage really mixes up the whole tradition thing, but it’s been fun (though not always easy) to blend our traditions, drop some, add, some, and make little changes to a few. I’m sure it will be interesting to see what happens when my kids grow up and do the same! Thanks for visiting the blog again today! Great article! I think in many ways families have become so consumed with work, we have begun to neglect the importance of family traditions. Every year I get my son, now 17, a birthday cake, even when he says he doesn’t want it. When I do, we smile, laugh and enjoy a slice of cake together. A simple act but very powerful. As he prepares to venture into the world, after reading your article, I want to share with him more about the traditions we have. Why we do some of the things we do and encourage him to create his own. Thank you! Hi Carolyn, I’m so glad you enjoyed this post! I think that, often, the simplest traditions are the best, because they don’t take a lot out of us, and there’s so much emotional return on the investment! Sharing WHY you have the traditions you do will go a long way toward helping your son establish his own with intention (or keep the ones you’ve started) down the road. I hope you come back and visit the blog again sometime soon! Wendy, what a fantastic part of your family identity to have, one of hospitality! That is fantastic, and I hope to grow our family more in that direction. As an introvert, I struggle a bit with people I don’t know well entering my home regularly, but I think it’s so important, too! Thanks for sharing! You are right, family traditions are great for building memories and family cohesion. We have a few of our own. For example, every fall we go apple picking together and we all look forward to it. I love the ideas you give, especially when it involves being generous together as a family like visiting a shut-in. I think we will explore that this year–building some traditions that involved helping and giving. Isn’t apple picking fun? We love it! I think that developing other, more relational traditions is important for helping kids get used to people who are different from them (and different from those they usually interact with). I feel that starting early is best with this, so I’m trying to get my kids involved with this kind of outreach now! Luisa, thanks for visiting my blog again today!